Revue mensuelle illustre d'etudes initiatiques / Revue Mensuelle d'etudes Initiatiques. Paris, France. Language: French. Publisher: Les Amis de Saint-Yves. 1/1-3, January 1913-May 1914. Ten francs a year (12 outside France). This is the epigonous successor to Papus's L'Initiation. In announcing the change, the journal admitted it needed a "transformation" and thought the new title was "adapte aux idees actuelles." Specifically, the journal would concentrate on the "arts divinatoires" and devote special sections to physiognomy, chiromancy, graphology, astrology and "hermetism." A rather sad comeuppance for a once haughty intellectual endeavor-heightened by the announcement that a page would be devoted to advertisements for books and a "Page des Consultations Psychiques" for "cartomanciennes" and "mediums." The journal would, it claimed, be the complement of all psychic reviews and continue to be intended for initiates rather than for beginners. It continued to function as the organ of the Ordre Martiniste and of the Eglise Gnostique Universelle, and to carry articles by Papus, F. Ch. Barlet (Albert Faucheux), Charles Detre (Teder)(a series on the war against the secret societies), Copin-Albancelli; A. Porte du Trait des Ages, Paul Sedir (Yvon Le Loup), "Jules Bois" (Henri Antoine Jules-Bois), Jean Bricaud, and the old crew from L'Initiation, but much of the excitement was gone. 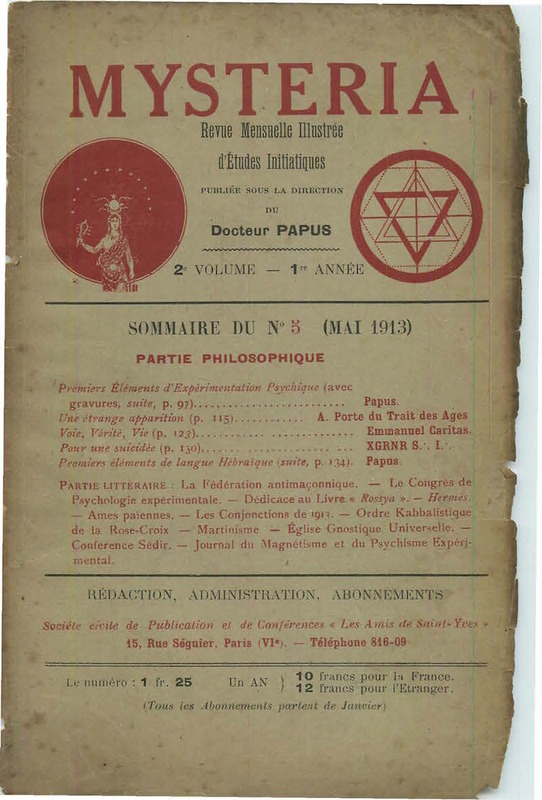 It announced on its inside front cover that it was the "organe officiel" of: Ordre Martiniste,,Ordre Kabbalistique de la Rose + Croix, Ecole Superieure Libre des Sciences Hermetiques, Union Idealiste Universelle, Rite Ancien et Primitif de la Franc-Maçonnerie, Rite National Espagnol, eglise Gnostique Universelle, Academia Symbolica, Oriental Templar Order (O.T.O. ), ecole Superieure Libre des Sciences Medicales Appliquees. The journal (as the successor of L'Initiation) was revived in the 1950s under the original name by Philippe Encausse, the son of Papus. After World War I, La Synthese Morale, Intellectuelle, Sociale (Marseilles) claimed to revive Mysteria, among other journals, but the magazine didn't last. Crabtree 1690. BNF. Microfilm.